RespiPatient’s new CO2 Kit provides real exhaled CO2 for hands-on capnography training. IngMar Medical’s Clinical Educator, Amanda Dexter, MS, RRT, CHSE tells us all about it in the interview below. 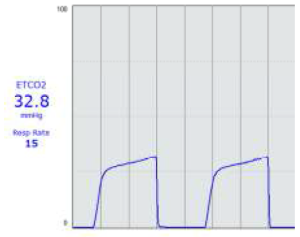 Realistic capnographic waveforms created using IngMar Medical’s CO2 Kit for RespiPatient. Q: What is capnography and why is it important? A: Capnography, or the measurement of CO2 in an exhaled breath, is a critical topic for clinicians today, and is often a key determinant in the choice of treatment for patients experiencing respiratory distress. Q: Is it true that the RespiPatient manikin can be used for capnography training? A: Yes, that is correct. With the new CO2 Kit, RespiPatient can produce real exhaled CO2 – enabling more realistic, hands-on capnography training. Q: Can you explain a how the new CO2 Kit works? A: The CO2 Kit is created by a kit which works as an intermediary lung and operates with a “bag in a bottle” concept. The CO2 injection is controlled from the RespiSim software where the user can select an output. Using CO2 tanks (not included), a ventilator, and a real capnography monitor, RespiPatient is able to generate life-like capnographic waveforms for your students to analyze. Eighteen patient disease models from the ASL 5000 Scenarios Library, including adult and pediatric disease states, have been validated with the CO2 Kit. Q: If you had to sum up the importance of the CO2 Kit in one brief statement, what would you say? A: Capnography has become a standard of care in medicine. We are giving users the ability to simulate a patient’s realistic ventilatory status in hopes of guiding immediate and future treatment strategies. Click here for more information about the CO2 Kit for RespiPatient.